Before the group of 25 Italian farmers arrived at Stanislaus State on Feb. 5, they were tourists, making overnight stays in Las Vegas and San Francisco, and the hats and new t-shirts the Italians wore spoke to how much fun they were having. 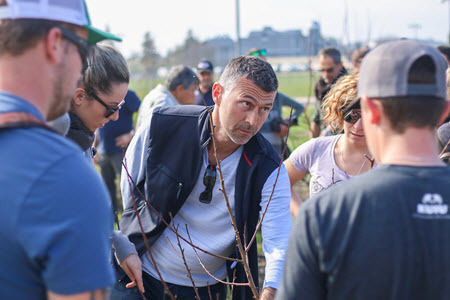 But the moment the farmers reached the University’s sustainable garden, where they were greeted by about 20 Stan State agriculture students, the business side of the trip immediately began to peek through the fun element. After all, they were here to learn, and the farmers’ group was here on a government grant to learn about the sustainable farming practices applicable to their own region. There were Muscat table grapevines, as well as pluot, cherry and peach trees that needed pruning. And since there also just happened to be no shortage of the tools needed to do the trimming, the farmers clicked into work mode with a combination of knowledge, speed, precision and purpose that amazed the students. In short order, the tools were handed to the students, who took over the task under the attentive eyes of the Italian educators. Their visit to Stan State was coordinated by Dr. Costanza Zavalloni, a professor of plant science in the Agriculture Department, part of the College of the Arts, Humanities and Social Sciences. Zavalloni, a native of Italy, worked in agriculture research before coming to America and earning her doctorate at Michigan State University. The majority of the group lives and works in the Emilia-Romagna region of central Italy, where the climate is very similar to that of the Central Valley and thus the farmers frequently are at the mercy of the weather. The visiting farmers raise a wide variety of products, most notably wine grapes, kiwi, apricots and peaches, but a few raise the young swine that become the region’s world-savored prosciuttos, and at least one of the visitors is a cheese maker who specializes in the region’s exclusive and authentic Parmigiano-Reggiano. Turlock was the base and Stan State was the first stop on the group’s three-day tour of the region. They spent an afternoon at 400+ acre Frantz Nursery in Hickman, where co-owner Mike Frantz told them about how water is obtained, stored and used, and how the nursery’s irrigation runoff is collected and reused. The following day, the group visited experimental nurseries in Tracy and Modesto, then drove north to Lodi to visit wineries and meet with wine growers at the Lodi Wine Commission. Their final day in the area was spent at a Turlock Irrigation lateral project outside Hilmar, followed by a visit to Duarte Nursery in Hughson and to Ferrari’s farm almond ranch in Ballico, where because of the unseasonably warm weather the first blossoms were out. But that was to be expected, Zavalloni pointed out. After all, this was only the first of what she hopes will be many visits to our region from Italian farmers. The goal, she said, is to open a dialogue that will help solve many of the sustainability issues shared by both fertile growing regions. “For example, in Italy they prune trees so they can do all the harvest from the ground, which saves on labor costs. And who knows if this region will have to start doing the same if labor becomes too expensive? Maybe the growers in the Central Valley will be forced to adopt many of the methods that they use in Italy.